Earlier this summer, the music world was dealt a huge loss with the untimely passing of musician Vinnie Paul Abbott. In addition to his renowned work as a founding member of PANTERA and DAMAGEPLAN, Abbott was most recently a part of the group HELLYEAH, which was set to perform at both Louder Than Life and Monster Energy Aftershock this fall. 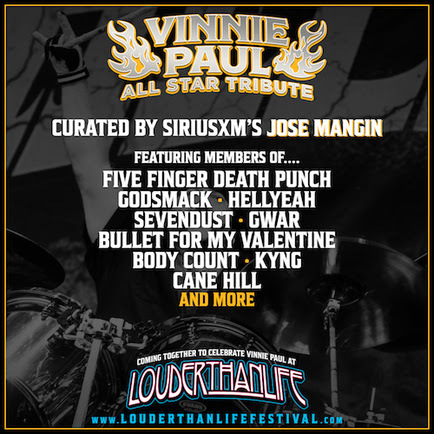 To celebrate the life and work of Vinnie Paul, Danny Wimmer Presents has teamed up with SiriusXM host and "Metal Ambassador" Jose Mangin for a very special Vinnie Paul tribute that will take place on Saturday, September 29 at Louder Than Life and on Saturday, October 13 at Monster Energy Aftershock. Mangin says: "Vinnie is an idol turned big-time friend, and he left a massive void on this earth. When Danny [Wimmer] and Gary [Spivack] asked me to put together something special for Vin, I knew the best way to pay tribute to him would be to throw a Texas-sized jam session belting out PAN-mutha-fukkin-TERA songs loud and proud! Everyone involved is doing this because they love Vinnie, and together we can all carry on his name, music and spirit forever!" The fifth annual Louder Than Life has expanded to three days in 2018: Friday, September 28, Saturday, September 29 and Sunday, September 30 at Champions Park in Louisville, Kentucky. The World's Largest Rock 'N' Roll Whiskey Festival features a wide range of music artists, including NINE INCH NAILS, ALICE IN CHAINS, GODSMACK, DEFTONES, LIMP BIZKIT, ICE CUBE, FIVE FINGER DEATH PUNCH, BREAKING BENJAMIN, SHINEDOWN and many more acts on three stages, along with award-winning bourbons, whiskey, spirits, craft beer, and the best food Louisville has to offer. 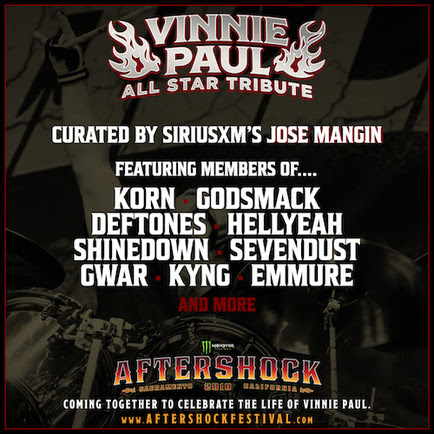 California's biggest rock festival Monster Energy Aftershock returns Saturday, October 13 and Sunday, October 14 at Discovery Park in Sacramento, California with a massive lineup of rock and metal acts. The lineup includes the festival debut of SYSTEM OF A DOWN, which hasn't played Stateside in three years, as well as Sacramento's own DEFTONES, marking seven years since they last headlined in their hometown. Other acts include ALICE IN CHAINS, INCUBUS, GODSMACK, SHINEDOWN, 311, SLASH FEATURING MYLES KENNEDY AND THE CONSPIRATORS, AT THE DRIVE-IN and more, as well as a variety of onsite food and beverage experiences. 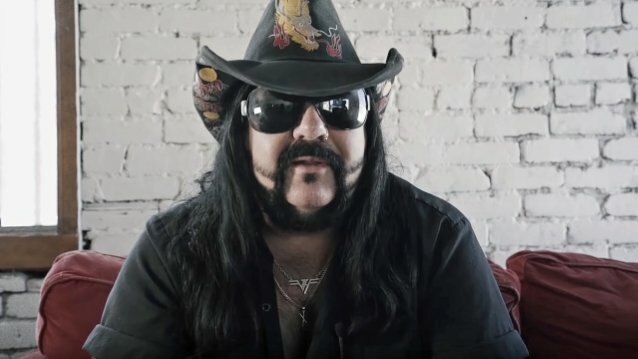 Vinnie Paul died in June of dilated cardiomyopathy, an enlarged heart, as well as severe coronary artery disease. His death was the result of chronic weakening of the heart muscle, basically meaning his heart couldn't pump blood as well as a healthy heart. He was buried in Arlington, Texas on June 30 next to his mother, Carolyn, and his brother, PANTERA guitarist "Dimebag" Darrell Abbott. There have been reports that he had just finished his drum tracks for the next HELLYEAH album.